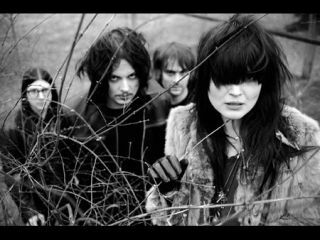 Last month MusicRadar reported on Jack White's new 'supergroup' The Dead Weather and their brief, five-song coming-out performance at a party in Nashville. Things must have gone well, because the band is about to play their first official show on 14 April at the Bowery Ballroom in New York City. If you have plans to be in the Big Apple that night (or you're a superfan and care to hop on a plane), tickets go on sale today, 8 April, at 10am EST. Visit The Dead Weather's website for ticket information. Said to be a mixture of raw blues, psychedelia and detached cool (sounds like a White project), The Dead Weather consists of Kills singer Alison Mosshart, Raconteur Jack Lawrence on bass, Queens Of The Stone Age's Dean Fertita on guitar and White, who plays drums and vocals (although we suspect he sneaks a guitar part in here and there). The band's debut single Hang You From The Heavens, available now on vinyl and through iTunes, can be heard (and seen) here. Check out the B-side, a brazen version of Gary Numan's Are Friends Electric? below. Just one question, though: With all of his various groups and projects, how is Jack White going to tend to The White Stripes reunion?